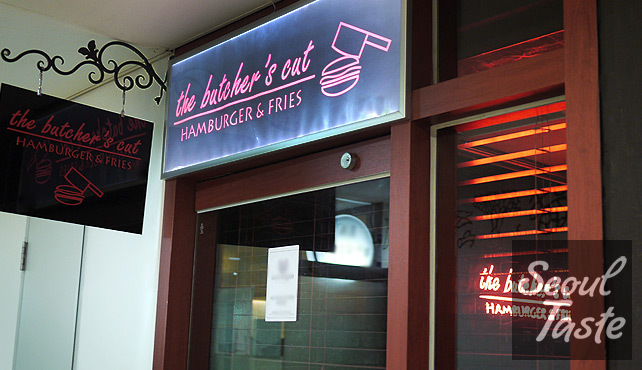 Update: This location is now closed, they are moving to Apgujeong. However, if you are going to be in the Apgujeong/Cheongdam area anyway, you might as well just go to Burger B. We've been here at least five times here since it opened and each time it seems to get better. As you step in, you may see a person grinding beef. Always a good sign when the beef is ground right in the shop, for two reasons: (1) less bacterial contamination, and (2) better chance of getting a burger with the perfect texture. Of course, like a coffee shop that roasts its own beans, this doesn't automatically equal incredible burgers (either of these advantages can be negated later by lazy or incompetent workers), but it's a great start. The menu is simple, and reminds me a little of In-N-Out (though I'm guessing this place doesn't have dozens of secret, off-menu options): you can choose either a single patty with cheese (Haute Burger, 8900원) or two patties with two slices of cheese (2x2 Haute Burger, 12900원). In-N-Out fans will know these as a cheeseburger and double-double. At lunch (officially, but often unofficially available all day), you can also get a set with a burger, pomme frites (steak fries) and soda for a scant 1400원 more. The burgers come out in about 10 minutes. 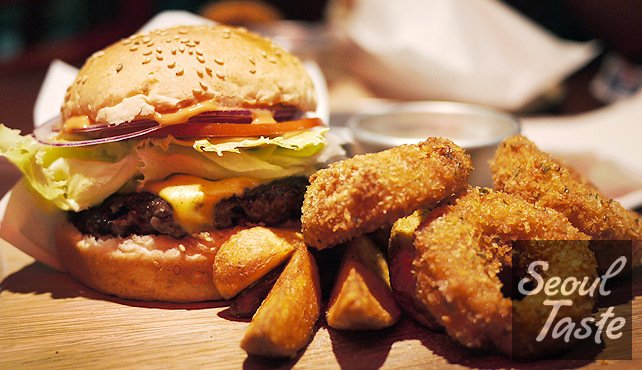 The burger is served on a wooden board with steak fries and an empty sauce dish (we like to fill it with a mix of ketchup and hot sauce). Although I ordered a lunch combo and Annie ordered just a burger, they distributed some of my fries to Annie's board as well. 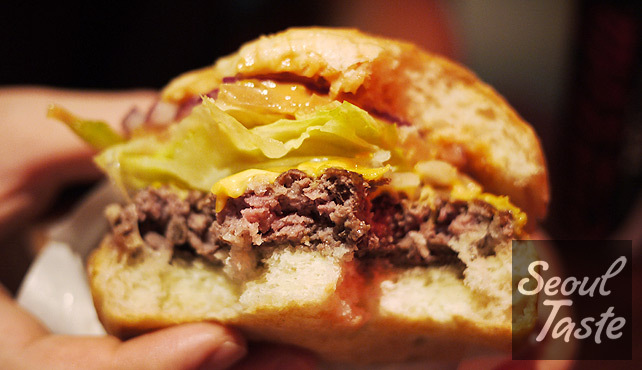 The burgers have improved in every dimension since the first time we dined here. First, I was surprised and pleased to see that they my burger came out medium, as it should. Some Koreans might be surprised to see pink meat in their burgers, but this is how burgers are meant to be enjoyed: beautifully grilled and charred outside and pink inside, well-seasoned without anything extra inside the patty. As for toppings, admirably, they stick to the basics: a slice of American cheese, slice of red onion, crisp lettuce, slice of tomato and pickles, topped with just enough thousand island dressing. The buns have also improved over time, whereas they used to be too small and overly charred, now they are the right size, have a nice texture (and sesame seeds!) and are now just lightly toasted. No overpowering flavors or scents, and no sweet Korean pickles here. Color in this photo is a little off, but this burger was perfectly cooked. They weren't when the shop opened last year. Annie enjoyed her burger as well, with the addition of some spicy sauce. The hot pepper sauce they have is less spicy than her favorite (Tabasco), but good nonetheless. 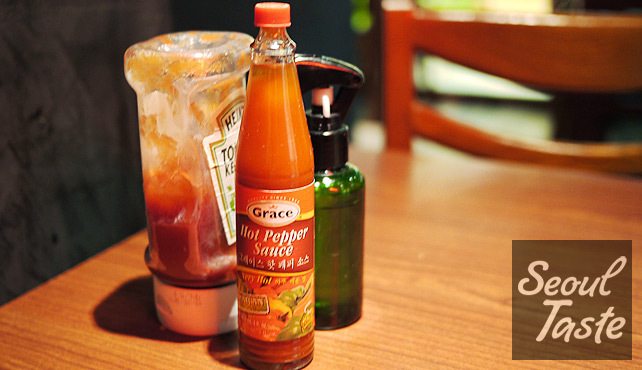 An unusual condiment is the spray bottle filled with vinegar. Use this on your fries, just be careful not to inhale any of it! We are optimistic that the changes here will continue to be positive, and not a passing fad, so we feel comfortable offering up The Butcher's Cut as a Seoul Taste Recommended Restaurant. We will continue to visit periodically, and if standards decline, we will update or retract this review. Service: 4/5 - Sometimes you might find empty ketchup bottles on the table, but overall service of the workers are great. Note: You pay upfront, even if you eat there. Atmosphere: 4/5 - Nice decor, clean, comfortable. Occasionally a bit too hot or cold, but so are most other places.